It’s almost official. As numerous sources have just confirmed that the Jio Preview offer will be now available for any 4G enabled device. Earlier the list was very limited, just with a few Samsung phones. The list expanded with addition to Samsung and LG phones and now Jio will offer 4G SIM card with the Preview Offer to all smartphone users, if their phones support 4G. 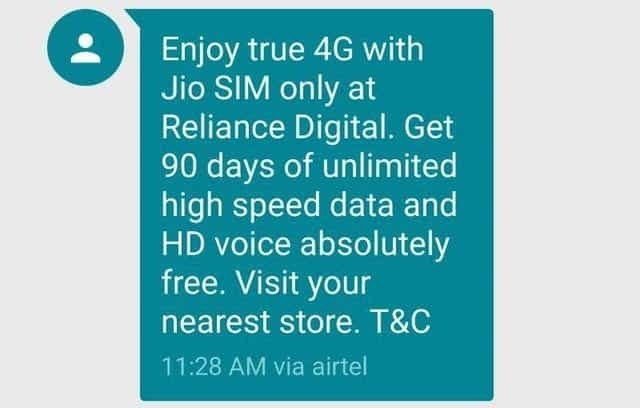 What do I get with the Jio Preview Offer? In fact, you get unlimited usage for three months. Let it be voice, data or even SMS you won’t be charged a single penny if you avail the offer right now. What documents are required to avail the Jio Preview Offer? Nothing much is needed. The process is just like any other SIM registration. You just need to carry your ID proof and address proof, along with passport sized photographs to avail the offer. As mentioned, carry the required documents and visit your nearest Reliance Digital Store or Jio Outlet and ask them for the Jio preview Offer. The sales person may want to check your 4G device. If they ask, just show your device. You will be asked to submit the required documents and after submitting, they will give you a new Jio SIM card. Insert and activate it by calling 1977. After activation, install all the Jio apps to avail the unlimited data, voice and SMS offer. So what are you waiting for? Just grab a Jio SIM card and enjoy high-speed internet on the move. In case you have already availed the offer let us know about your experience in the comments section below.